On this week's edition of the show we're going to commemorate a couple of "national" days, celebrate the birthdays of Harry Reser and Charley Straight and play some cardiac songs. 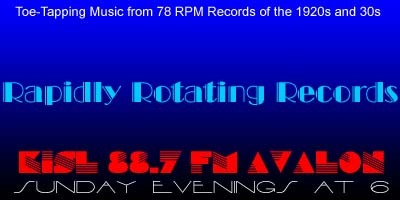 As always, simply click on the link below to listen streaming online and/or download. And your feedback, requests and topic suggestions are always welcome. Blame It On The Waltz – Edwin J. McEnelly's Orchestra / Henry Burr, v.
Maybe I'm To Blame – Earl Hines AHO / Valaida Snow, v.
Nothin' – Nat Shilkret AHO / Gene Austin, v.
My Heart Stood Still – Harry Archer AHO / Scrappy Lambert, Billy Hillpot, Ed Smalle, v.
My Heart Is Bluer Than Your Eyes – Nat SHilkret & The Victor Orchestra / Don Howard, v.
Blue Bonnet, You Make Me Feel Blue – Tuxedo Orchestra (Harry Reser) / Lester O'Keefe, v.
Yours With Love And Kisses – Fleetwood Orchestra / Tom Stacks, v.
Hi-Diddle-Diddle – Charley Straight and His Rendezvous Orchestra / Hannah Williams and Dorothy Williams, v.
Nesting Time – Charley Straight AHO / Keller Sisters & Lynch, v.
That's What I Call Keen – Charley Straight AHO / Frank Sylvano, v.